A chill is in the air. Our mornings are greeted with the smell of the great outdoors as we bust open our windows and take in the fresh morning breeze. Inhaling the change that is on its way. We sense that Fall is here. It is gently knocking at the door. We are listening. We are desiring it. I want the cool days of autumn to consume our afternoons with visits to the beach and the park. My family has always found the turning of the seasons to be a refreshing change. Fall is by far our favorite. Change is good. The summer season is remembered fondly as we embrace the cool breezes, the changing leaves and the anticipation of what the next few months have in store for our family. Fall is the time that we visit local attractions, go camping more often and ride our bikes with such vigor that we wish this time of year would last forever. Until it gets colder and the air is heavy with the impending snow that will soon fall. The anticipation of even colder weather is almost too much for my kids to endure with the anticipation of snow angels and missed school days. Now. We must enjoy what we have now. Now our weather is perfect. Have I mentioned it is my favorite time of year? With the chill in the air I find us yearning for soup. Hearty, rustic soup that comforts our empty stomachs and warms our freezing hands. Soup that gives you a fleeting thought of summer as bright vegetables float to the top, fighting for their chance to be seen and showcased. I love soup that simmers all day on the stovetop. I welcome the smell in our home. It is one more reminder that the weather is cooling and change is fresh in the air. My suggestion for this soup is to use a meaty ham hock. I saved ours from this summer and froze it. I left plenty of meat on the bone. I knew that I would use it in a soup and wanted there to be a piece of meat in every spoonful. I start the soup early in the morning and let it slowly simmer all day. I occasionally taste it as the water reduces and becomes richer in flavor. I add the necessary seasonings to make it just right for my family. I try and let the stock reduce by half. This may take 8-10 hours depending on how you have your stove set. I am home all day so I can watch it all day to make sure the stock is not simmered away leaving you with a dry pot. Adjust the recipe to fit the desires of your family. Omit the vegetables you do not like but add in the vegetables you have on hand or enjoy the most. This type of soup is one that you can give and take from. I like having these types of recipes in my collection. They are good basic recipes that you can fiddle with based on the ingredients you have on hand. Enjoy the change of the season in your own area. Do you welcome the change from summer into fall with such glee as we do? 1. In a large stock pot add all ingredients. Turn stove to medium high to bring water to a boil. 2. Reduce heat to low and simmer all day for 8 to 10 hours or until stock has been reduced by half. 3. Stir and taste soup periodically and adjust with more salt if needed. Lentils should be very soft and add to the thickness of the soup base. 4. 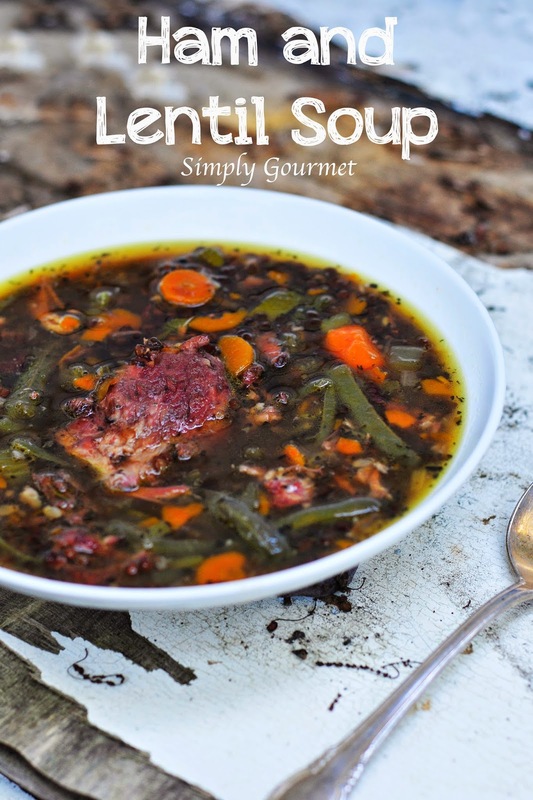 Serve soup immediately or portion for lunches and quick dinners for the week.